Recently bartenders from all over the country entered the Tales of the Cocktail competiton. The winners and their recipes are listed over at the Tales website. Unfortunately my cocktail was not among the winning entries. Fortunately, Jeffrey Morgenthaler is recognizing the "losers" over at his fantastic website. Jeffrey's got his creation, "Brazil '66," Sean Bigley's "Bayou Pearl," my "French Quarter," and Jamie Bordreau's "Colt's Neck Swizzle." These recipes all look good and I'm proud my drink is mentioned on the same page with those three superstars. 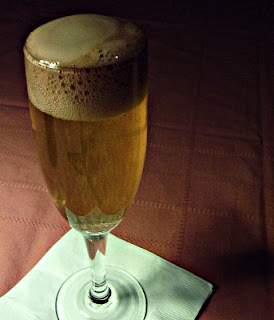 Shake gin, bitters and simple syrup over ice and strain into a champagne flute. 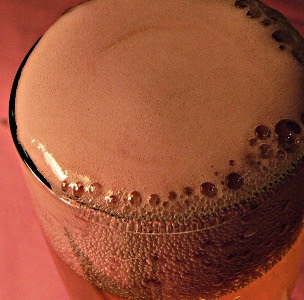 Gently stir in the Champagne and garnish with a thin layer of cassis foam. Since Tales is taking place in New Orleans, I thought it would be appropriate to use traditional Mardi Gras colors. Two of the traditional colors are gold (power) and purple (justice). I wanted to balance the golden Champagne with the purple Cassis. A nice touch would have been a sprig of mint to bring in some green (faith). So there it is. If you try it out, let me know what you think. The foam is easy to make and the texture is really nice, so if you have a whipper, try some experiments with foam. Campari foam on a Orange Blossom anyone? The 2007 Tales of the Cocktail Competition winners have been announced. Congratulations to all the winners! First Place went to the Starfish Cooler from Stacy Smith of GW Fins in New Orleans. Sean Thorpe of Cochon Restaurant in New Orleans took second place with the Doucette. New Orlean's own Michael Brewer tied for third place with Martin Cate of Alameda's Forbidden Island. Muddle orange slice and mint leaf in Collins glass. I haven't had a chance to try one of these, but it looks really good. I'm sure it is, since it came in first place in the competiton. If I were able to attend Tales this year, I'm sure I'd enjoy drinking one of these. I am slightly surprised by one thing though, and it's just a little tiny detail. This entry doesn't follow the rules of the competition. According to the recipe, this cocktail doesn't contain all the required ingredients! You can check out all the winning entries at the Tales of the Cocktail website. Jeffrey Morgenthaler is collecting losing entries here. I'll be posting my loser over there soon. Tickets are available now at the Tales website. This month's Mixology Monday is being hosted over at Married... with Dinner. The theme this time is champagne. I came up with a champagne cocktail called the 'French Quarter' for the Tales of the Cocktail competition. The competition is today, so I won't publish my recipe until later in the week. Tickets for Tales of the Cocktail are available now, so make your plans and get your tickets now.